At Revel Experience, we believe that consulting companies have a new imperative in the world of digital business: eliminating friction. Is that significantly different than the reasons why consulting companies exist? Continuing the analogy, the best flywheels operate in a near frictionless environment. Any friction, no matter how small, “steals” energy from the system. This “theft” causes the entire system to slow down and generate heat that can further tax the system and lead to unintended consequences. If you’ve ever been part of an engagement that’s gone sideways, I’m sure all of this sounds familiar. Typically, clients have to use different vendors for strategy, design, program management, and analytics. Each vendor has its own operating model, its own contractual terms, its own frameworks, etc. Switching between vendors can lead to political maneuvering, a breakdown in the continuity of delivery, and multiple levels of reporting and relationship management. To combat this, we reoriented our capabilities to cut across the entire lifecycle of a product, project, or program (strategy, experience design, organizational engagement, transformation, and analytics) for a complete end-to-end solution. We’ve defined our products not as practice areas or offerings, but as communities. Our communities are defined not just the type of work being done, but by the common environments encountered and mindsets necessary to deliver that type of work. For example: strategy isn’t just about business exploration, but also about being comfortable working in complete ambiguity and telling stories that catalyze action. By being able to build the right team based not solely on hard skills and capabilities but also in terms of how those personalities work most effectively, we can rapidly spin up the “right” team for your unique situation. If a company doesn’t foster the right culture, how can its resources be autonomous or self-sufficient when their management and leadership team aren’t around? If the consultant has to wait to make decisions, how can things to move as quickly as possible. We found that by putting our core community philosophies and guiding principles at the root of all that we do, Revel associates can make better real-time decisions. By giving people heuristics instead of algorithms, they can be more resilient in the face of chaos or change, even when working on their own without immediate input from management or leadership. By deliberately designing our internal processes to uncover and eliminate these hidden sources of friction, we’re able to get out of our own way, distill our value, and fuel our client’s innovation flywheel. 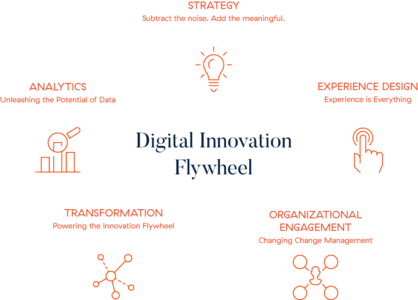 Revel does digital differently, and our flywheel approach is how we optimistically face our new digital imperative.